Parents often assign the task of mowing the lawn to older children and teens, but it can be a dangerous task if proper safety measures are not followed and enforced. Yes, mowing the lawn can be fun but just like any other outdoor powersport activity but a serious threat of injury lurks to our children, youth, and adults. My hope is that reminding everyone about lawn mower safety may eliminate many of the thousands of mutilating and fatal injuries that result from both riding and push- or walk-behind lawn mowers. It’s not just using these tools wrong but children, teenagers and adults in the same area as the mower can be hurt. Lawnmower safety should always be the number one priority when working with or around lawn mowers. Even if it’s just putting the mower in the storage shed everyone in the family should always proceed with caution. Regular discussions with your children about being safe around mowers can greatly reduce the risk of injury to them. Here are a few lawn mower safety tips: Feel free to add more in the comment section below. • Use a mower with a control that stops the mower blade from moving if the handle is released. In other words, when you take your hands off the handle the blade must stop immediately. Most mowers today both the blade and the engine stops. • Keep lawn mowers in good working order and have it serviced before you use it for the first time in a season. Good wheels, good mower blade, all safety shields in place including the flap under the back of the mower. Teach your children what to look for and listen to when it’s running. 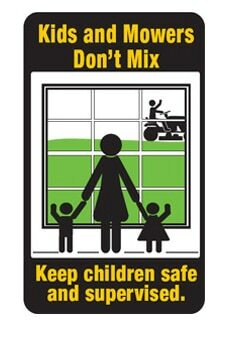 Teach your children to stop and have an adult inspect the mower if they feel something MAY be wrong. • Wear sturdy shoes with good traction, long pants, and polycarbonate protective eyewear. Sunglasses don’t protect from projectiles. Anyone else in the vicinity of the mower should also wear protective eyewear. Better yet, no one should be in that part of the lawn when the mower is running. • Children should be at least 12 years old before they are allowed to use a push mower, and at least 16 to use a riding lawn mower. Yes, they may be physically large enough to use the mower but they may not have the “safety sense” to keep themselves and others safe. • Only pull the mower backward or mow in reverse when absolutely necessary. When mowing in reverse, be sure to stop and check for children behind you. If you have children in the neighborhood just assume that they will be behind you so check before you back up. • To prevent riding mower rollovers, drive up and down slopes, never across them. Rollovers kill. • Always turn off the mower and wait for the blades to come to a complete stop before you remove the grass catcher, unclog the discharge chute, stop to pick up sticks, inspect or repair the mower, or when you cross gravel paths, roads or other areas. • If there is debris in the lawn mower, remove it with a stick or broom handle. If it’s a walk behind mower remove the spark plug cable – If it’s a riding mower be sure the key is removed and the parking brake is set. Blades and other parts under the mower are sharp so never use your hands or feet. I assume that is supposed to be 60 feet. Even the longest home run in history was only 575 feet. No way a mower can throw a baseball 600 feet. Maybe a golf ball. The danger is real, though. I had a mower shoot a small rock and shatter a window in my old minivan a few years ago.